I mean, how could I possible resist this blurb? I did what was best for me and the kids. I moved on. He lied, and cheated, and destroyed our family, but in the end I won. And now, I’m faced with a choice. What if you had a chance to rebuild and begin again? What if you could fall in real love, the kind you deserve, and leave two decades of your past behind. What if you could let go of the anger, and betrayal, and utter hatred for your ex-husband? What if no one knew? What if you had one chance, just one, to give him what he really deserves? What if it meant saving your own life? What if you had to kill him? GASP!!!!!!!! Oh all those what ifs had my mind racing. I needed to know where this was going STAT!!! It doesn’t hurt that I already LOVE this author (I read and LOVED two other books by her – First and Roam), so you know I couldn’t help but *squirrel* from what I was reading and jumped in and it TOTALLY hit the spot!! 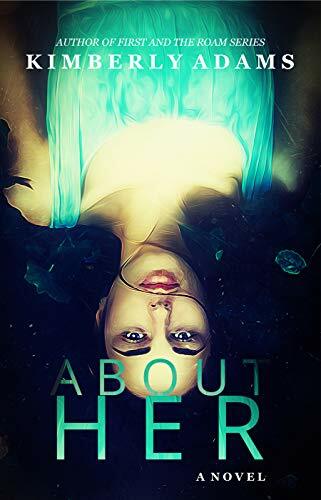 In fact, it gave me that “feel” of a few other amazing, yet insidious reads (Jezebel/Verity/and while I’m at it, most of Tarryn Fisher’s cunning – maybe even villainous – females like in Dirty Red, Bad Mommy, and especially Marrow 😉 ) that I loved so much. I’ve been looking for more in that vein and this one fits!! From the chilling start… I was HOOKED. Maryse: Kimberly Adams NEW PSYCH-THRILLER ALERT!! Oooooh SO up my creepy alley!!! MINE!!!! I’m starting it right now!! Amy: I’m intrigued over About Her (the Jezebel comment hooked me) but I’m holding out until you finish it, Maryse. Psych thrillers aren’t my norm, and it has to REALLY jolt you to make me want to read it. Maryse: I’m almost finished it and I stand by that comment. It is good!! Maryse: Okay I just wanna say “About Her” was excellent and confusing and crazy and came around full circle. It IS a psych-thriller and will keep you guessing (or at least, kept me guessing and I didn’t figure it out at all). The end did it for me, in the perfect way. Eeeeeep!! YAY ME!!! I love when that happens!! CJ: I’ve been looking for something a little different. Thanks for sharing! You know the kind that gently creeps on you? It feels good, and hooks you and like it could go anywhere. And even though it’s listed as a psych-thriller and even though that blurb gave me goosebumps… that maybe it could end up being a feel-good story, ya know? It has that feel. There’s good amongst the bad. It has you… comfortable… but feeling like something just isn’t right? But you can’t quite figure it out until it’s too late (kind of like that “frog in the boiling water” analogy). That’s the irony of an abusive relationship- you never quite know you’re in it until you’re out of it- mostly because your abuser is there to tell you you’re overreacting. GAH the craziest (yet quite possible) circumstance imaginable. Imagine heading home with your new wonderful husband, after visiting with family from the holidays, getting caught in a dangerous blizzard, and being stuck in a bed and breakfast for the night? And imagine realizing that the other couple staying at that same inn (also were blizzard-bound) for the night is your abusive, cheating ex-husband and his new wife (the one he left you for)? He bowed to her every will like she was some kind of trophy wife, though I struggled to articulate an actual title for her. Worse step-mom. Convenient. Convenient Wife. There was nothing trophy about Lana. “We all have a past,” she answered. Her statement should have sounded cryptic, but instead she added a shrug to lessen the importance. We all had a past. Every one of us. After so many years of an abusive marriage, I couldn’t help but balance all the new good I was fed daily from Jake with the old bad from Cal. Jake knew it and could feel the scales tip back and forth when he’d compliment me. Let it go. Move on. I’m with Jake now. Not that I needed a man to define my self-worth or self-image, but he made me feel beautiful, all the time, twenty-four-seven. And he told me I was beautiful. He called me beautiful, like it was my name. A confrontation of the life that once was, and the life that now is. And what a confrontation it is. Does it end well? My lips are sealed. 😉 That said, I just LOVED it to the very last line. 4.5 STARS!!! <— What a journey it was!!!! Three amazing books, all very different stories and she’s now forever made it into my “absolute favorite authors” list. Now I have to backtrack through her book list and devour more!! I already had this on my TBR but now you have me thinking it’s going to have to get bumped to a higher slot!! It sounds so good! Oh my! You’re reading too fast, too many awesome sounding books, I can’t keep up! !